This Starbucks Mocha Frappuccino clone is the perfect iced coffee drink for a hot summers day. Add in a touch (or more!) 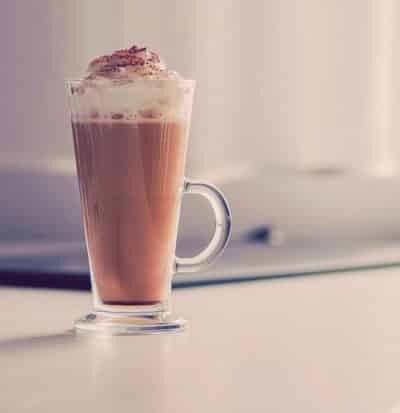 of chocolate and you have yourself one delicious mocha frappuccino recipe! This recipe can be applied to almost all Starbucks frappuccino recipes, just let your mood guide you. Why not replace the chocolate syrup with caramel sauce to create a caramel iced coffee! Top Tip - Always top with whipped cream and extra sauce to give that authentic Starbucks taste. Add a cup of fairly strong coffee, making sure it is chilled first, to a food blender. We use chilled coffee from our morning brew, however using a couple of shots of espresso is just as good! Then add the rest of the ingredients, (the milk, chocolate syrup, ice cubes and granulated sugar) to the blender, and whizz up for about 30 seconds. Make sure the mixture is nice and smooth. Fancy something a touch sweeter? Try making our Starbucks Caramel Frappuccino Copycat Recipe at home.